Women's Sweater Collection Just $26.99! Down From $90! Shipped! You are here: Home / Great Deals / Women’s Sweater Collection Just $26.99! Down From $90! Shipped! Women’s Sweater Collection Just $26.99! Down From $90! Shipped! Deal expires on December 5! 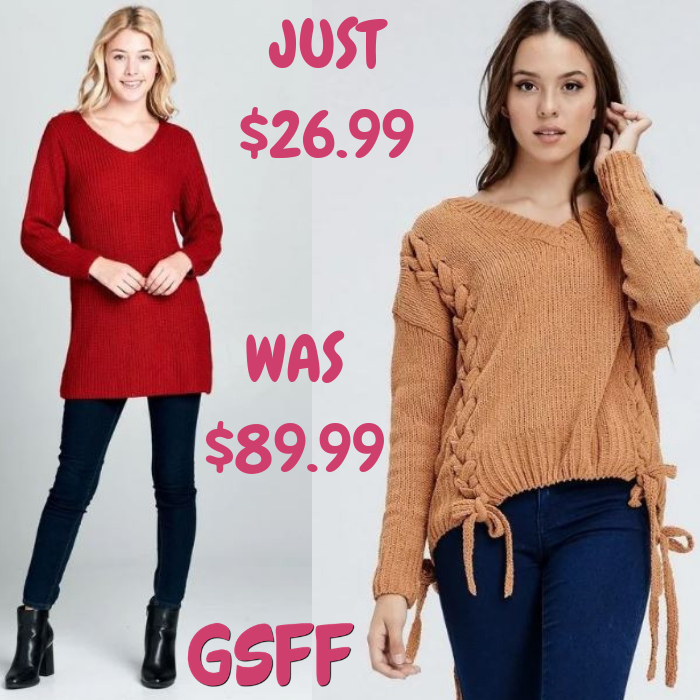 Jane is offering this Women’s Sweater Collection for just $26.99 down from $89.99 PLUS FREE shipping! Shop the best selection of women’s cozy sweaters, styles perfect for cooler months of long sleeve popcorn sweater with a hoodie. Includes ribbed hem and sleeve cuffs; V-neck, long sleeve knitted sweater. Back contains criss-cross straps and a hi-lo hem; V-neck, knitted sweater with hi-lo hem at the front (includes criss-cross tie-up on the sides). These are the sweaters you’ll want to live in this winter holiday season!